MISSISSAUGA, ON, Feb. 27, 2014 /CNW/ - Canada is a land of food lovers, but what we love to eat is as distinct as the country itself. From Chinese sweet and sour chicken to Italian pizza and Indian curry, we've got an endless list of favourite foods, secret family recipes and standing take-out orders. It is exactly these kinds of flavour-packed dishes and food rituals that the Lay's brand is inviting Canadians to use as their muse for creating the next great potato chip flavour idea. Back by popular demand, Lay's - Canada's favourite potato chip brand - today announced the return of its Do Us a Flavour contest, which invites fans across the country to submit their flavour ideas to be the next great potato chip flavour. Following its 2013 Canadian debut, the Lay's Do Us a Flavour contest quickly became a blockbuster success with more than 600,000 flavour entries from Canadians across the country. As a nation with an incredible mix of cultures and backgrounds, it's not surprising that ethnic dishes including jerk chicken, curry, butter chicken and wasabi each received thousands of submissions. "Food and flavour are a natural passion point for so many Canadians." says Susan Irving, Director of Marketing, PepsiCo Foods Canada. "From family-favourite recipes to ethnic take-out staples, we are inviting fans across the country to draw on these beloved dishes to find inspiration and submit a flavour idea." At least 1 in 5 (21 per cent) Canadians has had an idea for a potato chip flavour of their own, and of those, 52 per cent say their inspiration was their favourite food. 46 per cent of Canadians reported they can think of a favourite food or dish that they or their family eat, that would make a tasty chip. Of a list of favourite international dishes, respondents reported that Italian pizza (21 per cent), Chinese sweet and sour chicken (17 per cent), Mexican guacamole (15 per cent) and Indian chicken curry (11 per cent) were most likely to taste great as a potato chip. Of the listed take-out foods from other countries, half (50 per cent) of all Canadians surveyed said they order Chinese food most often and one-quarter (26 per cent) say they most often order Italian. As part of this year's competition, television personality James Cunningham teams up with the Lay's brand for its Do Us a Flavour contest for the first time. A food explorer, James is passionate about discovering great flavours through his intrepid culinary adventures and food truck finds. "I spend a lot of time trying over-the-top dishes and celebrating exotic flavours across this great country," says James Cunningham, host of Eat St. "Now I get to inspire Canadians to celebrate their own creativity and submit their ideas for the next big Lay's potato chip flavour." Canadians can now engage with Lay's Canada on www.Lays.ca/Flavour, and join the flavour conversation on the brand's new Twitter destination at www.twitter.com/LaysCanada. In April, the submissions will be narrowed down to four finalist flavours by a panel of qualified judges and will then be made available in stores nationwide beginning on or around August 10. Once they hit shelves, Lay's fans across the country will be able to purchase and try all four finalist flavours and vote for their favourite until October 15, 2014. While all four finalists will have the chance to see their flavours come alive on the shelf, only the grand prize winner will take home $50,000 plus one per cent of their flavour's future sales (after the voting period). The grand prize winner is set to be announced in November 2014. More details and official contest rules are available at www.Lays.ca/Flavour. 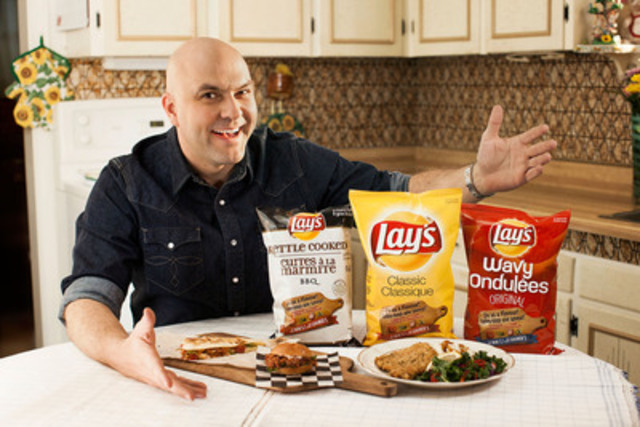 The Lay's brand is supporting the 2014 edition of the Do Us a Flavour contest with a robust marketing communications lineup including the launch of a national TV spot on March 2, digital advertising, in-store marketing and promotional packaging. From January 29 to January 30, 2014 an online survey was conducted among 1,503 randomly selected Canadian adults who are Angus Reid Forum panelists. The margin of error—which measures sampling variability—is +/- 2.5 per cent, 19 times out of 20. The results have been statistically weighted according to the most current education, age, gender and region (and in Quebec language) Census data to ensure a sample representative of the entire adult population of Canada. Discrepancies in or between totals are due to rounding. Lay's potato chips are Canada's favourite potato chip brand, leading the market share in all Canadian regions. Lay's is one of PepsiCo Canada's flagship brands. For more information, please visit www.lays.ca. PepsiCo's businesses in Canada are organized into two business units. PepsiCo Foods Canada includes Frito Lay Canada and the Quaker Foods and Snacks business. PepsiCo Beverages Canada includes Pepsi-Cola Canada, Gatorade and Tropicana. For more information, please visit www.pepsico.ca. PepsiCo is a global food and beverage leader with net revenues of more than $65 billion and a product portfolio that includes 22 brands that generate more than $1 billion each in annual retail sales. Our main businesses - Quaker, Tropicana, Gatorade, Frito-Lay and Pepsi-Cola - make hundreds of enjoyable foods and beverages that are loved throughout the world. PepsiCo's people are united by our unique commitment to sustainable growth by investing in a healthier future for people and our planet, which we believe also means a more successful future for PepsiCo. We call this commitment Performance with Purpose: PepsiCo's promise to provide a wide range of foods and beverages from treats to healthy eats; to find innovative ways to minimize our impact on the environment by conserving energy and water and reducing packaging volume; to provide a great workplace for our associates; and to respect, support and invest in the local communities where we operate. For more information, please visit www.pepsico.com.